Quinnipiac recently picked up their second 2003 born commit in the last six weeks in OHA Edmonton Bantam defenseman Oscar Plandowski. This is following the commitment of 2003 forward Jack Silich back at the end of December. Plandowski is the fourth Quinnipiac commit to come out Nova Scotia. Coming from strong hockey blood lines the BobcatsHockeyBlog recently caught up with Oscar Plandowski to talk about his decision of choosing Quinnipiac, hockey in general among other things. Thanks to Oscar for taking the time to do this. BobcatsHockeyBlog: First off congratulations. Tell us your emotions after making this decision. Oscar Plandowski: I am extremely excited about the decision I made. Quinnipiac is a great school and I am thrilled to be apart of Bobcat Nation. BobcatsHockeyBlog: Your father Darryl was a very good college hockey player and the captain of the 1991 NCAA championship team at Northern Michigan that played in the wildest national championship game ever with an 8-7 win in triple overtime over Boston University. What did he tell you about that game and the feeling he had of winning of national title? Oscar Plandowski: I’ve seen the highlights from that game and I have heard a lot about it from my Dad. It is one of his claim to fame and he is very proud about it. Obviously it is one of my dreams to accomplish what he did and I’m looking forward to an opportunity at that with Quinnipiac! BobcatsHockeyBlog: With your father an amateur scout with Tampa Bay and your mother a power skating coach you must have been on the ice at a very young age. What have they both taught you in order to get to this point of your life to commit to a college to play hockey? Oscar Plandowski: My mom had me on the ice at a very young age and obviously taught me how to skate. My dad has always taught me the importance of hard work and skill. Both have taught me a lot and I wouldn’t be in this situation without them. BobcatsHockeyBlog: Your one of four commits from Nova Scotia to commit to Quinnipiac following Peter Diliberatore (2000), Ethan Phillips (2001) and Jacob Quillan (2002). How much did those players being committed to Quinnipiac play a part in your decision and have you played with them in the past? Oscar Plandowski: That definitely played a huge role in my decision. I know Ethan and Jake very well and they are both great players and I have been on the ice with them many times. I talk to Ethan a lot and I really look up to him as a player. When he committed I set that as one of my goals for the future. BobcatsHockeyBlog: Tell us about your overall recruiting experience. What other schools were interested in you before you committed to Quinnipiac? 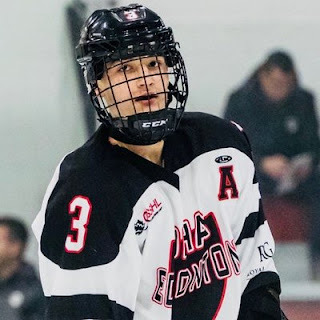 Oscar Plandowski: I had been talking to Minnesota-Duluth, North Dakota, and Providence and visited the latter two schools. The process was exciting but also nerve wracking at times and I left this process mostly up to my father and my adviser. I’m very happy with my choice in Quinnipiac and I am looking forward to the opportunity that lies ahead. BobcatsHockeyBlog: What went into your decision to move from the Nova Scotia Bantam League with Halifax Accel to OHA Edmonton in the CSSBHL? Oscar Plandowski: There were many factors that went into play but the main reason was I wanted to make my game more complete overall. I had just made the switch from forward to defense when I went into with Accel. I really needed to work on my defensive game play. It was a big decision to leave but I think it has worked out well so far. BobcatsHockeyBlog: What were some of the reasons you made a change to defense after previously playing forward? Oscar Plandowski: It was honestly a very hard decision to make. I hadn’t really made up my mind until the day before tryouts. I had the opportunity to try defense that spring in a tournament and I liked it. And I haven’t looked back since. BobcatsHockeyBlog: Tell us what are some of the strengths of your game? Oscar Plandowski: I feel my biggest strength is my skating. I believe my skating is why I could make the transition from forward to defense like I did. In my opinion another strength of mine is my hockey IQ and making a good first pass. BobcatsHockeyBlog: What are some of the things in your game you want to improve upon? Oscar Plandowski: Some skills in my game I am focusing on at the moment are my play in the defensive zone and power play poise. I am really looking forward to improving my strength this summer and getting stronger for next year. BobcatsHockeyBlog: Is there a player you try to model your game after.? Oscar Plandowski: Two players I try and model my game after are Cale Makar and Mikhail Sergachev. They both have amazing poise with the puck and have great two way play. BobcatsHockeyBlog: Tell us the type of player that Quinnipiac will get on the ice in yourself? Oscar Plandowski: They will be getting a two way defenseman who has a lot of offensive upside along with a player who isn’t afraid to play physical and makes smart simple plays. BobcatsHockeyBlog: Tell us what type of person the Quinnipiac community is getting off the ice? Oscar Plandowski: I feel that the Quinnipiac community will be happy with the way I hold myself as a person. Good character is very important to me and I hold myself to a high standard. BobcatsHockeyBlog: Who are some of the role models in your life? Oscar Plandowski: My biggest role models are definitely my parents. My mom and dad have always supported me in everything I do. I look up to them for all the sacrifices they make to allow me to play hockey. BobcatsHockeyBlog: What are your plans over the next few years for your development? Do you expect to continue with OHA Edmonton? Do you eventually want to play in the USHL? Oscar Plandowski: Next year I am going to be following in the footsteps of Ethan Phillips and play hockey at Selects Academy at the South Kent School in Connecticut. I haven’t decided where I want to play after that yet. The Selects program is a great chance to improve my game and I am very excited for the opportunity. BobcatsHockeyBlog: With Nova Scotia not having an NHL team do you have a favorite team in the league? Oscar Plandowski: I am a big Tampa Bay Lightning fan. BobcatsHockeyBlog: Off the ice what are some of the things you enjoy doing? Oscar Plandowski: I spend most of my time off the ice with my friends. Whether it’s going to the lake or shooting pucks we do everything together. I spend lots of time in the summer at my friend Zach’s cottage. I am looking forward to seeing them when I get back.